I’ll be honest – I’ve never been a fan of marshmallow-topped sweet potatoes. I know, I’m probably in the minority with that sentiment. 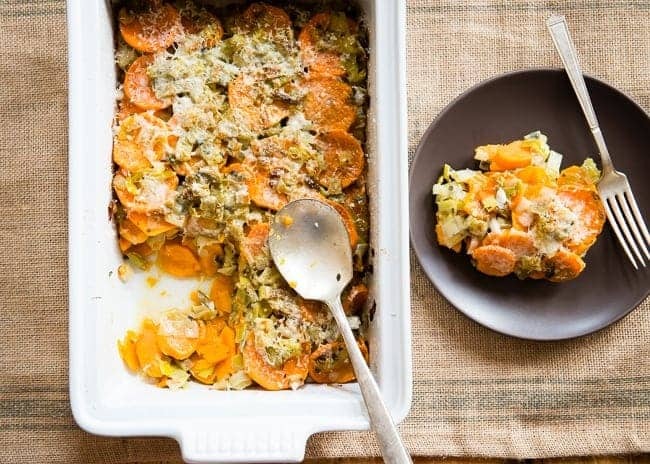 Instead, we like a more savory sweet potato dish to accompany our Thanksgiving feast. 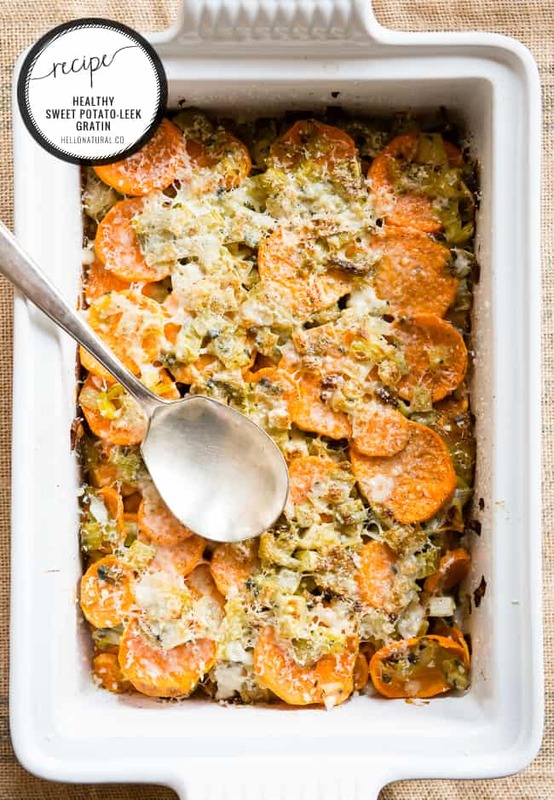 This year I’m including this healthy sweet potato gratin on our menu. Typically gratins include loads of butter, cream and cheese. This one gets a healthy makeover. It still has cheese – just enough to be delicious. Leeks and fresh sage are added for extra flavor in place of butter and cream. Leeks, if you haven’t used them before, are in the onion family. They add a great onion flavor without being too overpowering. A hint of fresh nutmeg adds another little something to the dish. 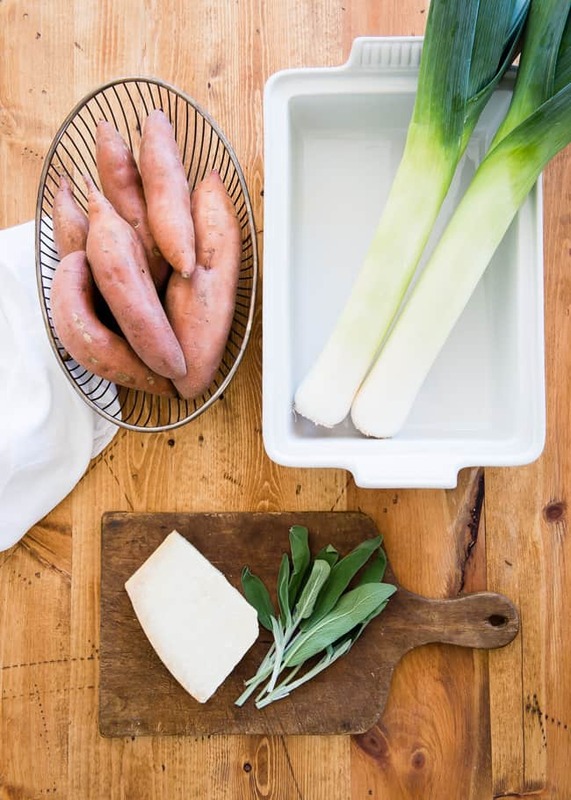 The sweet potatoes are very thinly sliced and layered with the leeks. The flavors meld together as the gratin bakes. This is really easy to make – it can also be made the day before and reheated. Another plus when you’re busy doing other meal prep and don’t want to worry about it. What’s your favorite way to enjoy sweet potatoes for Thanksgiving? A healthier version of a classic potato gratin made with leeks for extra flavor and topped with grated Parmesan. In a 10-inch skillet, heat 2 Tablespoons of the olive oil over medium heat. Add leeks. Cook, stirring frequently, until leeks start to soften. Add a little water, if needed, to prevent them from burning. Season with a little salt and pepper. Add the minced fresh sage, and cook for another 1-2 minutes. Lightly oil the bottom and sides of an 8- by 11-inch baking dish. Arrange 1/2 of the sweet potato slices over the bottom of the baking dish. Season well with salt and pepper. Top with half of the leeks and sprinkle with a little freshly grated nutmeg. Repeat with remaining sweet potato slices and leeks, again seasoning well with salt and pepper, and a sprinkle of fresh nutmeg. Cover the top of the dish tightly with aluminum foil. Bake for 40-45 minutes. Remove from oven and uncover. Sprinkle cheese over the top. Raise the oven temperature to 450°F and bake for another 10 minutes, or until the cheese is golden brown. Let cool for a few minutes before serving. This is probably one of the best sweet potato recipes I have ever had. I will definitely be making this again! Thank you!! If you were going to make this a day ahead, would you bake until before adding the cheese and do the cheese after you reheat the next day? You could do that, certainly. But it’s also fine to make it all the way and reheat, or if you wanted, you could just prep it and bake the next day. Been looking for a recipe for using up sweet potatoes. Being from Wales I am used to leeks and put them in lots of things – fab in a quiche with cheese and bacon. Gonna try this tmro with the Sunday roast. My grocery store doesn’t carry leeks. What would you suggest as a substitute – just slice a yellow onion? That would be fine! You could also sub green onions. Or you can just leave them out. My sister-in-law made the sweet potato gratin a couple of months ago and it was delish. I’m trying it today and Thanksgiving day. I tried this tonight and it’s AMAZING!! Thank you for this! I’m not a big fan either of marshmallow topped sweet potatoes dishes, so we’re both in the minority. I feel like I’m eating a dessert rather than a side dish. I was asked to bring a sweet potato dish on Thursday, so I’m looking forward to trying this. Leeks are one of my favorites. My mouth is watering just looking at the pictures. I’m very excited to try this. Plus it’s not expensive to make. Thanks for the idea. Love this idea! These look so sophisticated. Pinning this!